The half-day conference will feature insights and strategies on programmatic selling from companies like Bonnier Corporation, Mediavest | Spark, Hearst Core Audience, Razorfish and more. With advertisers forecasted to invest more than $30 billion in programmatic by 2019, programmatic selling is one of the biggest opportunities for magazine media companies. 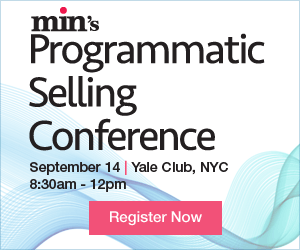 min has assembled a team of programmatic experts to deliver the insights and strategies publishers need to grow their business through programmatic selling. The conference will be held on Wednesday, September 14 at the Yale Club in New York City. Early bird rates end August 24, 2016. The agenda is set to cover three major topics: selling inventory, driving sales with data, and measuring programmatic success. Confirmed speakers include Razorfish’s director of programmatic, Emmy Spahr; Hearst Core Audience’s vp of programmatic sales, Julie Clark; Bonnier Corporation’s director of programmatic, Semande Agosa and more. To view the full agenda, visit http://www.minonline.com/programmatic-selling-conference/. min’s IlluMINator Awards Breakfast, honoring excellence in magazine media sales and marketing will take place the following day, on Thursday, September 15 at the Yale Club in New York City. Multi-event discounts and group rates are available. For questions about the conference or registration, please contact Zoe Silverman at zsilverman(at)accessintel(dot)com. To inquire about sponsorship opportunities, please contact Tania Babiuk at tbabiuk(at)accessintel(dot)com. min is the industry's trusted source on the consumer and b2b magazine business, reaching thousands of media executives through print, online and in-person events. For more than 60 years, min has been serving the magazine and media community with unparalleled coverage of this ever-changing industry. For more information, visit http://www.minonline.com.